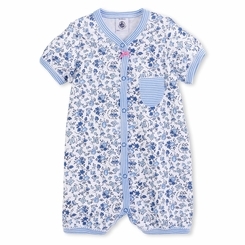 This baby girl's cotton shortie adopts a lovely vintage floral print from the Petit Bateau archives. This baby garment has a poppa opening on the front. We love the shortie's elaborate details: the elegant picot finish, the small bow, and the little pocket on the chest. Material: 100% cotton.